The main work represented in this recording, Paradise Lost, is divided into roughly three sections. In the first section, covering books one through four, we are shown how Satan manages to regroup his followers after their defeat in Heaven, how they decide to renew the struggle with God, how Satan escapes from Hell and makes his way to earth to do mischief, and how God discovers Satan's new plot and decides to allow it to unfold. The next section, books five through eight, take place on earth as we are introduced to Adam and Eve, their discourses with God's angels, and a retelling of the battle between God and Satan as rendered by the angel Raphael. In the last section, books nine through 12, Eve is seduced by a disguised Satan and eats the forbidden fruit. Adam, distressed at the event, yet unwilling to be parted from Eve, decides to eat the fruit and share her fate. God sends His Son to earth to render punishment, but only after the Son pleads successfully on their behalf for mercy. He descends and tells Adam that they can no longer remain in Eden, but then takes him to a place and shows him a vision of mankind's future. Paradise Regained follows the Gospel of Luke in presenting the story of Satan's temptation of Jesus in the wilderness. In striking contrast to Adam and Eve, Satan is utterly foiled in his attempt to corrupt the Son of God. 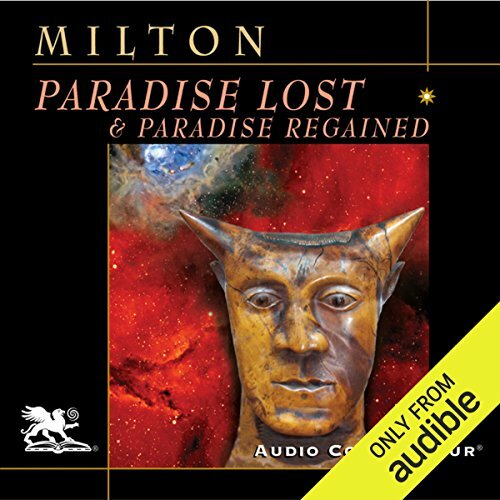 Other reviewers criticized this audio book for the 2 hour bio of Milton. I thought the biography of Milton was excellent. It really puts the poem in perspective and gives the reader a better appreciation for Milton and for Paradise Lost. If you don't want to listen to the bio, just skip to the poem. Milton's beliefs about the relationship of church and state were way ahead of his time, and he quite literally put his neck on the line for his beliefs. Milton is often criticized for staying loyal to Cromwell long after it became clear that Cromwell had abandoned many of the principles which helped him come to power. But what choice did he have? The alternative to Cromwell was the Crown. With Cromwell and his successors there was some hope however slim, with the Crown there was none. Anyhow, the poem itself is very well read, but listen to this when you can focus such as on a walk. If you're listening in the car you'll be hitting the 30 second rewind a lot or missing much. This is no fault of the narrator, it is just a very dense work. 58 sur 58 personne(s) ont trouvé cet avis utile. SELL YOUR SHIRT FOR THIS AUDIO BOOK! Having listened to both Naxos sets (Anton Lesser), Blackstone (Ralph Cosham) and (Nadia May) for some years, I have to say that Griffin really holds the listener. You can soon skip the biography if you wish. You can also enjoy and learn from 'Paradise Regained' as this, too, is really an added bonus in this set! If you are troubled with understanding at first, read Lanzana's novel or his plain English version. C. S. Lewis has a famous 'Preface'. Nicolson's 'Reader's Guide to John Milton' is also a great way to start. Blarmire's 'Milton's Creation' is a superb commentary. Keep listening to Milton, especially this set, and you'll find a life-long friend - by far the best writer of all! 96 sur 97 personne(s) ont trouvé cet avis utile. One of the separation points I have when reading classical poetry is that it's just not the same when reading to yourself. Poetry of this caliber demands a performance. From Homer to Shakespeare and beyond, epic poetry requires the performance from a master with a strong voice to get the drama across on a higher level. Charlton Griffin delivers that punch, catapulting the listener through some of the best epic poetry ever offered in this planet's history. For those who only think they know the story, and especially for those who seem to think of Paradise Lost as merely "Biblical fanfic," I would invite those people to spend some time in the mind of the literary genius of Milton through this work. And as a bonus, you get the sequel for free, as well as a 2-hour bio of Milton so as to place these works in the historical and spiritual contexts in which they were written - a time of ecclesiastical upheaval. Getting the proper perspective makes all the difference when understanding and appreciating a work like this. Would you listen to Paradise Lost & Paradise Regained again? Why? I would listen again. One, because it's necessary to understand everything that Milton is trying to say and two, it's very interesting. It makes you think about Christianity from multiple angles which takes you down trails of thought that you may have never ventured before. Mr Griffon's performance was great. I couldn't ask for more than he delivered in this audio. You could not take this all in one sitting. Unless you're very comfortable with Olde English and very versed in all the literary references. I am/was not. It would have taken me over 48 hours straight. Gets sleepy at times. Easy to get lost in the language and references. Be prepared to rewind alot. Also helpfull to have some sort of study guide to reference while listening. I can confirm that the actual Paradise Lost narrative doesn't begin until the 2:09:45 mark. I'm amazed this audiobook spends the first two hours giving biographical info, sample poems that aren't actually a part of the main narrative, etc. Otherwise, the reader's voice is by far the most engaging, dramatic and rich among the offerings here at audible. If cost is not an issue, I'd recommend this version and skip to the time hack indicated above. 48 sur 52 personne(s) ont trouvé cet avis utile. While I hesitate to review Milton's masterpiece because it is indeed a masterpiece of Western literature, here's my best shot at it. "Paradise Lost" starts with the fall of the angels and ends with the expulsion from Eden. After Lucifer is cast out of heaven for leading a revolt against God, he gets revenge by setting into motion mankind's fall from grace. "Paradise Regained" is a sequel of sorts; it tells the story of Jesus's life with particular emphasis of the temptation in the desert. "Paradise Lost" is Milton's magnum opus, with each word and each phrase seemingly hand-picked for its role in this epic poem. The language is necessarily dense with meaning, so don't rush through this one. In fact, in order to fully appreciate the work for its rythm and packing, it should be recited aloud, even if only to yourself. "Paradise Regained" takes a different approach than its predecessor. It is excellent in its own right, although it lacks the impact of "Paradise Lost." Lucifer here is reduced to a wheedling minor character, whereas before he was a bold and insidious rebel. In short, definitely read "Paradise Lost", and read "Paradise Regained" only to complete the epic story told in both poems. Milton's poems describe, respectively, The Fall of Man and The Temptation of Christ. I first read them when I was a very young man and got little out of them. Re-reading and hearing them in my late middle age, I loved and revered them. I admired Milton's art both as a poet and a dramatist. His version of the The Fall is a tragedy as much as an epic, with scenes of high drama and psychological insight as well as of poetry and theology. I saw the personal as well as the spiritual damage that the heroes, Adam and Eve, sustained, and was glad that they and their kindred were given their hope of redemption. I did find Milton's Satan an excellent villain, nothing more, despite claims by those who apparently only read the first half of the story. I was surprised that I was more than half convinced by Milton's justification of the works of God. I accepted, during the reading, at least, the Father's reasons for not doing more to protect his special creation. In the sequel, I agree with the Son's refusal to be impressed by what the Tempter had made of the world and his promise to reclaim it and rebuild it. As for the narrator, Griffin has made a specialty of the classical and the epic, and his reading of this English epic is as good as anything he has done. This is a truly amazing book. I loved the story and the narration. I highly recommend listening to this audio book. Time to finally tackle Milton! You know you'll never read this heady classic, so why not let Charlton Griffin bring it to life as you listen. You might imagine, as you listen, the work as blind Milton dictated it to his daughter. Shakespeare and Milton, the masters of English! Beautiful almost Beyond Compare. Beside William Shakespeare there's no master of the English language that compares with John Milton. The performance too is masterful and brings a work with somewhat antiquated language truly to life. Inklusive einer hilfreichen Biographie von 2 Stunden Laufzeit. Das Hörbuch ist insgesamt sehr gut und lebhaft erzählt.